Brisk, well-written narrative about Chinese relationships with Western powers, finding a long history of broken traits, mutual distrust, and backbiting. He starts after the end of WWI (incredibly enough, not in the middle of the Opium Wars or the Boxer Rebellion), and continues through the handover of Hong Kong in 1997. Bickers takes a wide sweep - he covers art exhibitions, the tensions between Chinese city and countryside, and the 'yellow peril' in movies and books. He does not write about the Japanese and their interventions as much as I would like, but he gives a broad survey of the Russians in China as well - from the Empire through Soviet 'advisors', then removed after the 1960 Sino-Soviet Split.He is critical of both foreign aggressors and Chinese excess - he knows that humiliation and invasion are a part of Chinese history, and yet he refuses to let the party-state dominate that narrative. An interesting book, not least because this history is not quite dead, and the People's Republic has largely inherited the old borders of the Qing Dynasty. Bickers would have earned five stars from me had he stopped writing after the 250 or so pages that bring this history to 1949. 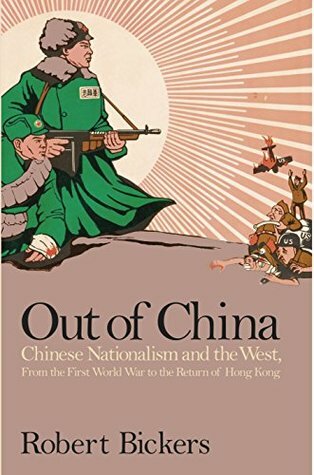 Until that point, he does a brilliant job of illuminating Chinese nationalism, artfully mixing the perspective of foreigners (which is dominant, but never approved of, thus useful) and that of Chinese. However, his account of the People's Republic didn't do it for me. He spends more time talking about how few foreigners there were in Shanghai than the Bandung Conference and generally ignores China's foreign policy after that point. When foreign voices become basically irrelevant, he starts talking about Maoist faux-radicals in the West in the '60s and '70s. He also began to overplay his arguments about the impact of Chinese nationalism. “What matters in China matters to us all.”This book is an excellent scholarly account and a very detailed history of China from the end of the First World War to its rise as a powerful country in the 21st century. Robert Bickers, a professor at the University of Bristol, tells a complex tale of the forces of attraction, rejection and interdependence that have consistently defined China’s varied dealings with the world.When looking back at the history of World War II, we tend to concentrate on the military contributions of the United Kingdom, the United States, and the Russians. China, which had fought alongside the Western allies against Germany, tends to be forgotten. And yet, China’s involvement in the war was massive. It was one of the longest and among the bloodiest. China paid a hefty price, it lost an estimated 14 million people in the World War II. Had China folded, Japan’s capacity to fight the U.S. or even the Soviets would have been vastly amplified.But the end of the World War II did not bring glory to China. After years of misery and devastation, China was left with its territory partially occupied, and its internal politics subjected to relentless and decisive meddling from the outside. Only after U.S. insistence, it was made a permanent member of the newly formed U.N. Security Council. The end of the war brought more suffering and humiliation to China. It was a failure of diplomacy, writes Bickers. In the 1946, China fell into all-out civil war between the Nationalists and the Communists. It was a brutal war which brought more misery and suffering to the Chinese people. By the time it was all over in 1945, Chiang Kai-shek’s China was finished. The communists controlled most of the mainland and Mao Tse-tung became the most powerful man in the country. Between 1946 and 1976, tens of millions died from repression and starvation. China’s strategic reorientation changed at the end of the 1970s. Deng Xiaoping had sufficient political capital to reorient both the international and domestic policy environment. Without being an economic specialist or particularly self - confident about economic issues, he managed to create a framework for successful economic reforms , without contributing much to the specific content of economic reforms. Why does any of this matter now? Although it never politically took hold in mainland China, as it did in India or Africa, the cultural and political legacy of British imperialism and the experience of World War II shape Chinese attitudes today, especially between China and the United States and China and Japan.Out of China is a massive work, but it worth all the effort and the time. Robert Bickers covers everything from popular culture and art to wars and politics. He sheds light on Chinese new nationalism which is characterised, he argues, by anger “Being effectively equipped with the facts might help us understand the roots of that rage.”If you want to understand China’s crucial role in the modern world, this is a good place to start . “For China the past is becoming more important.” A richly detailed, assiduously complied and cogently crafted history of China since 1917, this does much to restore balance in how the Nationalist period is to be seen, and also to identify the ebbs and flows in the country’s history. I enjoyed the author’s previous book “The Scramble for China”, but this is better. The writing is less self-consciously clever, whilst still retaining elegancies and fruitfulnesses. It is less indulgent in its own picturesqueness, which makes its structure clearer and its messaging less opaque.This is to be highly recommended: for students of modern China and for those who want to understand the shoulders on which the country’s current leaders stand and the wind which directs their programmes. More than many other countries, China continues to relive their past, or at least the version of the past they present to themselves. Robert Bickers - Robert Bickers is Professor of History and Director of the 'Historical Photographs of China' project at the University of Bristol.